Basic wound care has evolved from keeping a wound dry so that a scab or "eschar" would form and protect the wound to an appreciation that wounds heal more rapidly when kept moist. Behind this concept is the recognition that the exudate in a wound bed provides an optimal environment through which healing is promoted. Today, maintaining a moist wound equilibrium and the prevention of infection are the guiding principles behind the optimal care of both acute and chronic wounds. Here's how these principles can be applied in pharmacy practice. Acute wounds are common and include lacerations, minor cuts and abrasions, from which most individuals will readily heal provided there is no underlying medical problem that might delay wound closure. All wounds are contaminated, but not all wounds are infected. 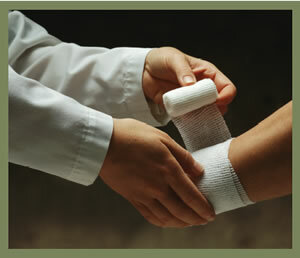 Since infected wounds do not heal well, it's important that a wound be thoroughly cleansed and infection avoided. Wounds that look red and swollen; that have signs of purulent drainage or odour, or wounds that are warmer to the touch compared with nearby skin are more likely to be infected than wounds without these signs. The use of topical antiseptic agents can reduce the bacterial burden in the wound and, if used correctly or in slow release formulations, agents such as cadexomer iodine are recommended for the treatment of infected wounds. On the other hand, topical antiseptics in general promote drying of the wound bed and may potentially delay wound healing by removing the exudate if over-used. Therefore, topical antiseptics, though helpful in the treatment of infected wounds, should be used judiciously. Alternatively, a variety of specialty dressings help create a moist wound environment and reduce the risk of infection, and many pharmacists recommend their use for even minor cuts and abrasions to promote optimal healing. With specialized burn centres treating the majority of burn patients today, pharmacists are likely to see only patients with first or second degree burns. These burns range from a superficial, reddened area of the skin, like a sunburn, to a blistered injury site which typically heals spontaneously after the blister fluid has been removed. Initial therapy should include cooling of the burn injury site, followed by modern principles of acute wound care, including the promotion of a moist wound environment and prevention of infection. Patients may also require pain relief, which may be provided through over-the-counter analgesics. Specialty dressings also help protect nerve endings from environmental stimuli, and alleviate pain as well as promote more rapid healing. The most common chronic wounds include pressure and venous ulcers, which together represent a significant source of morbidity in Canada today. For pressure ulcers, topical antibiotics may be used to reduce bacterial counts but their use should be limited to non-healing ulcers and for short periods only. For venous leg ulcers, a topical antiseptic such as cadexomer iodine can be effective when properly applied, while antibacterial silver dressings may be used in combination with other dressings. Adequate compression is also required for the treatment of venous leg ulcers and a 4-layer bandage system is available which offers sustained, graduated compression as well as an optimal healing environment.